This does sound delicious but I have never seen pistachio instant pudding here and wonder what I could use as a substitute. The recipe reminds me a little of the way ambrosia is made. That vase is so adorable and the salad does sound delicious. I will have to make it when the kids come over. We were able to put our porch furniture out yesterday, but still alittle cold and wet for sitting out. That will change by the end of the week. I've heard of that salad before but haven't tried it... yet:@) Have a great week Kitty! How funny, I wonder if it was popular during the Watergate scandal? It seems like lots of retro recipes are making a comeback. I remember when pistachio pudding was all the rage :) Have a great week Kitty, you tea things are always so special and I love your new sweet face vase! Oh Kitty, This is my favorite tablescape so far. The pattern on the teacups is so beautiful. The tablecloth made by your mom is stunning. What a treasure. Love the recipe too. Hasn't the weather been nice, except for today? ENjoy your week! What a lovely tea today. I do love that tablecloth your mother made. How lucky for you to have it. This is so pretty and springy! Love it. What a talented lady your great aunt Kitty was! I just love that teacup! How nice it's warm enough for tea outside. We are getting there, and actually had several days in the 60s last week...but back to grey and a bit of drizzle today. I always wondered why Watergate...now I know! 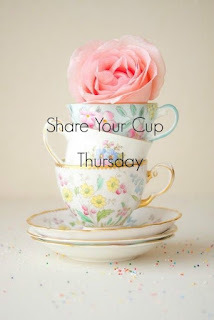 Have a wonderful week, and thanks so much for linking to Tuesday Cuppa Tea! That tea cup is darling! Very special that you have it to enjoy now. Your mother's embroidery is lovely, too. I always appreciate things handwork that others worked on for some time. I just love this little vase with her rosy cheeks and long eyelashes! I've made that "salad" way back when!LOL!! I recently had it at a funeral and some of the people there never had it before! Very pretty teacup. I think I would love that salad...I love pistachio! How wonderful to be able to sit out on your patio. It's still too chilly here. I'm fascinated that your Aunt painted the teacup...wow! Your Mom's tablecloth is beautiful & what a great keepsake. I love pistachio anything. I don't think I've tried this salad, though. Must add it to my list! Your adorable lady vase filled with purple flowers made me smile, Kitty. Love it! I've never heard of Watergate Salad before but it looks like the perfect treat during warmer weather. I remember Watergate Salad. It's delicious! I also wondered why it was called a salad. It's sweet and yummy. What a lovely tea and yes the teacup pattern is so pretty. Your birthday gift from your daughter is delightful, love the face and the cloth is precious! Yum, I don't know why this is salad but I would eat as a dessert all day long. Thanks for sharing your pretty tea on the patio. Kitty, your trio is gorgeous! 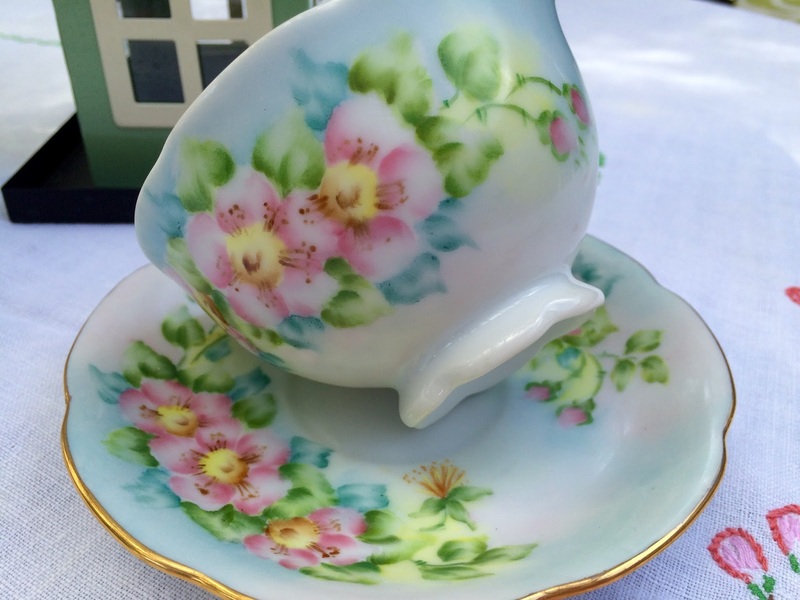 Wow- your great aunt Kitty painted the teacup & saucer. So delicate looking. The vase made me smile. She looks shy. And the embroidery is a treasure! I've never heard of Watergate salad. Looks delicious! Oh my goodness Kitty, this is the most BEAUTIFUL table you've set!! That tablecloth is absolutely gorgeous -- a real heirloom! Your mom did a super job on it. 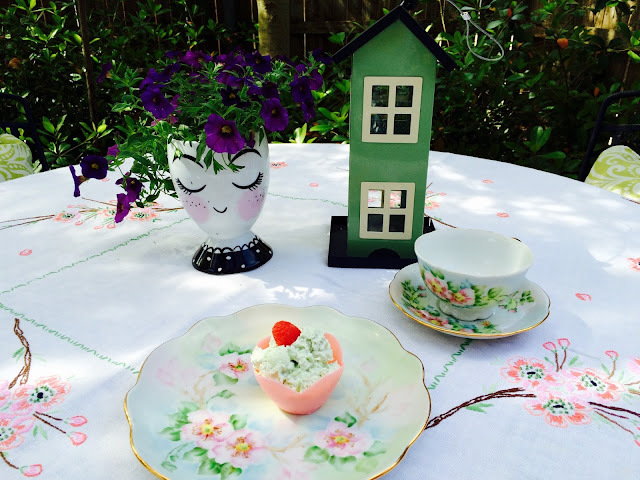 :) I love that the china your Great Aunt Kitty painted perfectly matches the flowers in the tablecloth. I also love your purple flowers in the lady vase; they provide a real pop for the table. The green bird feeder is darling. :-D That Watergate Salad recipe has been around for quite awhile, hasn't it? It looks so tasty and pretty in your little pink bowl. I really enjoyed this post, Kitty; thanks for sharing with us. Hope you have a good week! Yum, I like the pistachio pudding as a pretty dessert made with milk and this does sound like a tasty option. The vase and birdhouse were nice birthday gifts and I always love your Aunt Kitty's hand painted teacups. Oh yummy, I think I have had this before! Would love to have it again, LOL! Lovely gifts you shared with us! The embroidered tablecloth does match your sweet little trio very well! Hope your week got off to a great start! I have been to many dinners and had Watergate salad. I think it's time for me to print out your recipe and make it myself. It looks delicious. I am a very sentimental person and your handpainted trio is wonderful! That means a lot to have from your aunt and the tablecloth is lovely and you will always treasure it! Thanks for sharing. 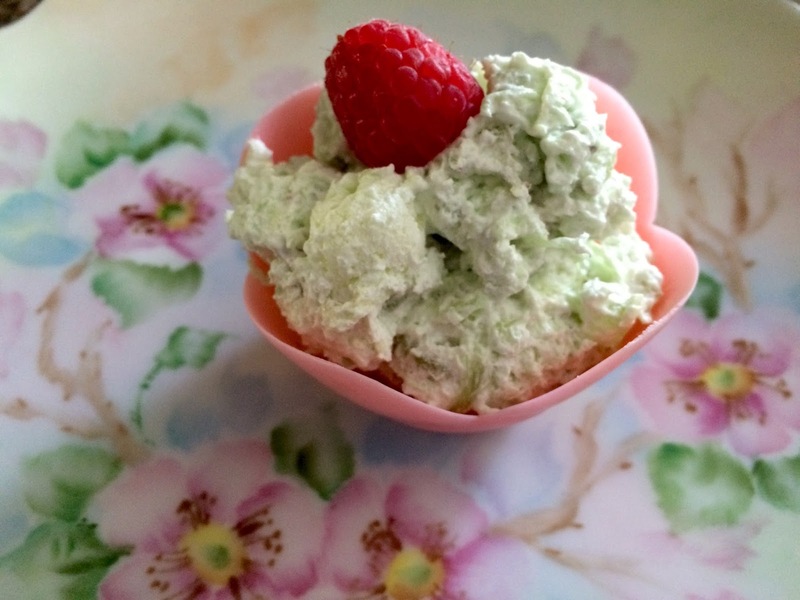 Kitty, my mom used to make the Watergate salad, and my sister and I loved it! Have you had the pistachio coffee from Dunkin Donuts? Yum! The vase and birdhouse were perfect birthday gifts, and your Aunt Kitty's hand painted tea cups and mom's tablecloth are such treasures. Hi Kitty, oh your Watergate Salad looks so good. I have also made this and remember the fascination back in the 70's when it became so popular. I love your painted trio set your Aunt Kitty created. She is a super talent and her work is stunning. Lovely and inspiring for me to see. Lovely vase from you daughter. The painted face is sweet. I adore the feeder too and how gorgeous is the beautiful linen with the coordinating design that matches your trio set so well. Your mother is also very talented in her stitch work. You come from a talented family Kitty so it's no wonder you are so talented and creative too. Thanks for sharing this delightful tea. Have a great week. My grandsons always made some kind of pistachio salad for the holidays when I was younger, maybe it was this one. Your gifts are darling, Kitty, and yes I love the pink cheeks and freckles. Oh Kitty I love Watergate Salad...grew up on it and Ambrosia. I don't know why they ever called it a salad either because they always serve it for dessert or with your food. Who knows? At least we get to eat it...yummy. Your table is beautiful. This is one of Ramon's favorites but I don't let him have it very often. It's purely delicious and decadent! I use pecans most of the time, but when I toss in pistachios....wowza!!! Hi Kitty! I just bought a cookbook at a thrift shop today and have gotten through looking through it and there was this recipe! :) I haven't ever made it but it looks and sounds so good! What a lovely setting too. 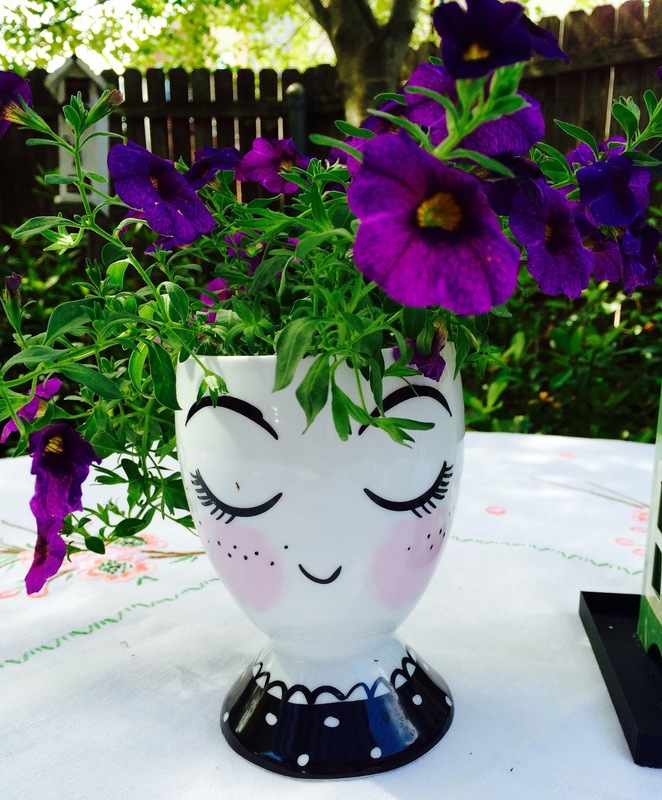 Love your pretty tea cup and saucer and the little head vase is adorable! Hope you're doing well and thanks for popping in to see me. Hello Kitty, I liked the 1st name for the recipe too! I bet it's delicious. Yummy Kitty! You always come up with the best little recipes. How sweet your Mom embroidered the cloth...very special and that darling face with the cutest face is the sweetest ever. Hi Kitty, what a lovely place to have tea and dessert! 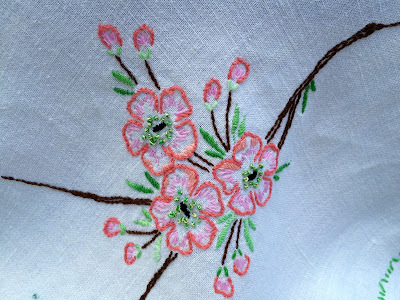 How sweet to have your Mom's embroidered cloth, it's quite the showpiece. Your teacup is quite lovely and the dessert I have had but did not know that was what it was called. Learn something new everyday right? I remember Watergate salad well. It is like a dessert. Your tablecloth is beautiful. I know you cherish it. Your Aunt Kitty is very talented and you are right the trio set looks perfect with your Mom's embroidered cloth. Your vase is delightful too. Kitty, I always am in awe of your gorgeous cups painted by your great Aunt! Your tablecloth is perfect and what a wonderful heirloom piece. I haven't had this salad for a long time. I've never heard it called Watergate. Learn something new every day. :) Thanks for sharing with SYC. So, so happy to see you here today at TOHOT! Kitty, how lovely to enjoy a treat on your patio. Your trio and tablecloth look made for each other. The cup and plate in my link belonged to my honorary grandma (a friend's mother), and the hand-embroidered napkin belonged to another friend's mother. Now this is a blast from the past! I remember this salad and used to love it! I'm glad to have the recipe again! Beautiful tea Kitty! I just love that hand-painted trio, gorgeous. Such a special keepsake, as well as the hand embroidered tablecloth. They are really treasures. Watergate salad -- haven't heard that in years! Like the pretzel salad I sometimes make, it's really more like dessert. Love those retro recipes, so comforting. Maybe more because of the memories attached to them? Coming from Chicago originally (the home of Kraft Foods) I remember having that salad way back when. It is good. I love your pretty tablescape too! The salad sounds delicious! It sounds similar to ambrosia salad (also, more of a dessert). Looks really good ... I do like that pistachio pudding! What a pretty tea set with such a sentimental story. What a PRETTY post, Kitty! Just lovely! I haven't had Watergate Salad in ages...I remember it well, but never made it myself. Thanks so much for the recipe. I can't wait to try it out on my quilting friends. I want to comment on so many things - the yummy recipe, the lovely tablecloth, the darling vase. By goodness, your great aunt's china is super stunning! A very pretty tea cup set...and the freckled faced vase is adorable. Watergate salad is a very favorite of mine. I make it often for our family and home fellowship friends. I agree with you, Watergate Salad has always been more like a wonderful dessert to me, we just love this recipe. Your tea table is lovely and so inviting. Hope you are enjoying the spring weather. Thanks so much for sharing with us at Full Plate Thursday. Have a great weekend and come back soon! Oh this delicious dish brings back happy memories! My grandmother used to make it. We just had that "salad" at Easter. My sister makes it and it seems to be a favorite. I guess with the Watergate scandal going on back then the name got adopted and used for this salad. The dishes that your Aunt painted are so pretty- love the colors. The freckled lady face is sweet and the bird house is very cute. I admire people that can embroider so nicely. The tablecloth of your mother's is a treasure! This is a classic that my mother and aunts used to make! :) I think the editor was funny in changing the name...although Nixon and his "Watergate" episode was not. I've always enjoyed this and yes, it's more of a dessert. I've seen a salad like that at potlucks and such and it tastes wonderful / LOVE the beautiful artistry from your mom and aunt! :) Especially from your mama.. that is just a treasure...so much time and talent goes into something like that. Hi Kitty! Love your decorating style! Do you know where your daughter found the vase? Hi Irene! I hope you see this reply. I was going to email you, but you're a noreply comment blogger. The bottom of the vase says that it came from Target. I hope you find one!